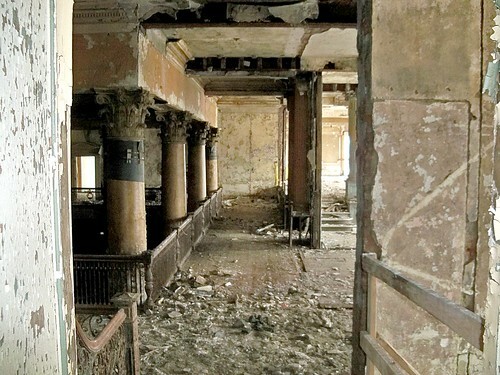 Sometimes, engaging in urban exploration is like experiencing an alternative reality. In these abandoned and often beloved structures, ghost-like representations of what “once was” collide head-on with their current state of decay and ruination, representing a dream-like status between existence and non-existence, somewhere in the middle of life and death. Naturally, a local band with a name based upon the concept of an alternative reality, combined with the imagery of open wounds, and the catch phrase “Stay Dead”, would conclude that one of Northeastern Pennsylvania’s most popular urban exploration sites would be the perfect setting for filming a music video or two! Condusta came up with the band name in 2003 while watching an HBO show called “Carnival”–specifically, an episode titled “The Road to Astoria”, when he became intrigued by the idea of an alternative reality, but one very similar to the one we know. That “alternative reality” notion is the main reason I chose to write about Astorian Stigmata for my blog about urban exploration, because that is the very concept that urban explorers are trying to capture when they photograph the abandoned structures where people once lived, worked, played, worshipped, dreamed or suffered. Condusta was drawn to the word Stigmata for its powerful look and strong pronunciation. Which is a relevant choice, because the visual images portrayed in many of the band’s videos are both harsh and destructive. Yet, in listening to the lyrics, you can’t miss the sentimental vibe—like a verbalized wish that life was less fragile and that people, places and things could be more permanent. Dennis explained that “most of my lyrics are about dualities. Which is also why we use black and white stripes so consistently in our logo and branding—they represent the ups and downs of life, and that they are both equal, and both present at all times.” Many of their song lyrics are quite philosophical, touching upon concepts such as being “re-born through death”, as in the lyrics of the one video filmed at the Huber Breaker. “It refers to an existential death and coming back to life as a better person, but only after your old sense of self has died”, Dennis stated. Fans consider the band’s catch phrase, “Stay Dead” and their entire “death” theme, as a metaphor for the kind of self-fulfillment that leads to happiness by remaining true to yourself. Dennis Condusta became interested in playing guitar at a young age, because his older brother also played. As luck would have it, he won a guitar when he was 16, at a BMX riding contest. He was influenced by the music of Modest Mouse (“Dramamine”) and Taking Back Sunday (“A New American Classic”) plus a strong desire to create his own music. “I have no interest in learning cover songs. I just knew I had a feeling inside me and I wanted to learn to get it out as fast as possible”, he said. Dennis also states that his most important influences are his brother and his friends. And believe me, he’s not kidding! 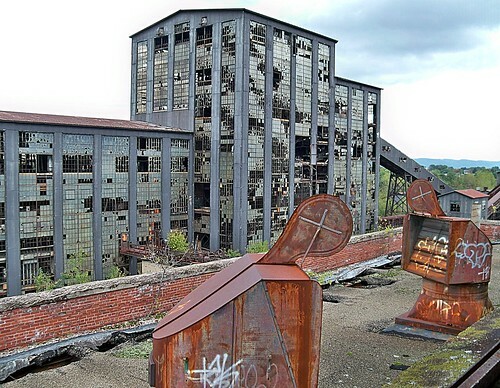 One of my personal, most interesting experiences with the Huber Breaker includes running into a group of students from Germany, taking pictures of the Breaker, as one of their stops on an “Urban Exploration” tour of the industrial ruins along the east coast of the United States! Of the two Astorian Stigmata videos filmed at the Huber Breaker, “The Beginning Of An End” is the most artistic in nature, and therefore open to individual interpretation. I thought it would be interesting to analyze the video/lyrics within the context of the historical setting with Condusta. The start of this video features a guy in a camouflage suit collecting water samples from this industrial site in a post apocalyptic world. I found it somewhat poetic that in the beginning of the video you hear “stay safe”, because the irony is that for the men who worked at that dangerous site, in such a high-risk industry, that’s what they, and their loved ones, were thinking every day. Dennis found that interpretation interesting, but said that it wasn’t quite what he was thinking while creating that scene for the video. The video also features a vampire, which I interpreted as a representation of the coal company literally feeding off of the coal miners to turn a profit for themselves, while their employees often lived in impoverished conditions. I asked Dennis why he chose to end the video with the sound of a laughing child. “That was just to provide and exaggerate the feeling of unease that I was attempting to convey”, he explained. You can find more information about Astorian Stigmata by visiting their official website and Facebook page . Maximilian Aladar was born on May 28th 2005. He is the creation of Dennis Condusta who was in need of someone to play the drums for his band, because at that time, he was playing all of the instruments himself on the recordings. Dennis made Max that very night, never finishing his legs or giving him a mouth. This way, Max could not talk back (using words) or run away. Today, Max serves as the guide for Astorian Stigmata. He is the puppet master who is a puppet…..